The most complex Cartier wristwatch ever, the Rotonde de Cartier Grande Complication Skeleton boasts a minute repeater, perpetual calendar and tourbillon - inside a self-winding movement just 5.49mm high. When Cartier first started developing its line of high horology watches, its grand complication timepieces were powered by movements from Renaud & Papi, the technical specialist owned by Audemars Piguet, with the Grand Complication Skeleton pocket watch being a prime example. 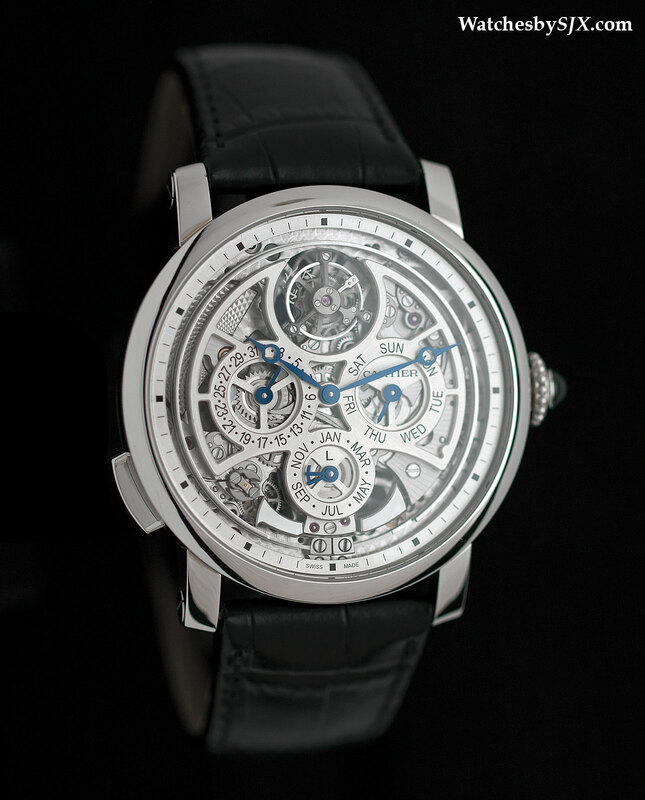 Now Cartier has its own grand complication, developed over five years and manufactured in-house, the Rotonde de Cartier Grande Complication Skeleton. While the Crash Skeleton was by far the coolest watch introduced at SIHH 2015, the US$620,000 Rotonde de Cartier Grande Complication Skeleton was the most impressive. It is an old school high complication, with traditional complications stacked up inside the movement, instead of an exotic or avant-garde movements in the vein of Greubel Forsey. Traditionally grand complication means a chronograph, perpetual calendar and striking function, like the A. Lange & Söhne Grand Complication for instance. But instead of a chronograph, the Rotonde de Cartier Grande Complication Skeleton has a flying tourbillon regulator, which helps keep it unexpectedly thin. Comprised of some 578 parts (an ordinary, time-only movement has about 100 parts), the 9406 MC movement is a surprisingly slim 5.49mm high. 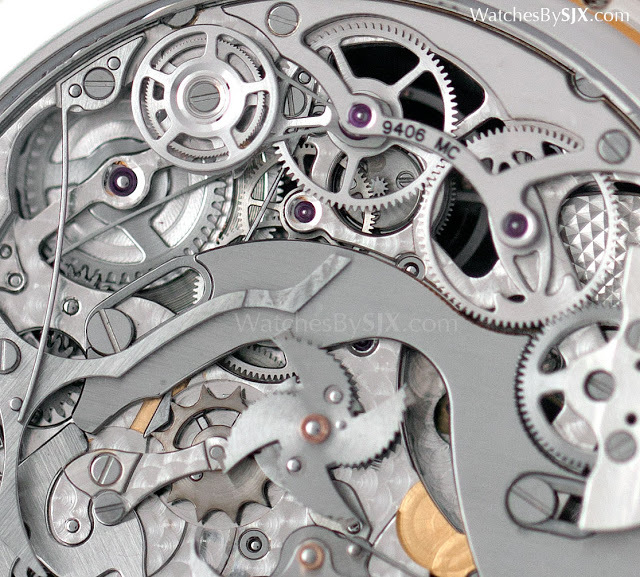 By comparison, the Lange Datograph chronograph movement is 7.9mm high. And the Jaeger-LeCoultre that’s the thinnest minute repeating watch on the market has a movement that’s 4.8mm high, equipped with only a repeater and tourbillon. The compact dimensions of the movement were accomplished with clever movement construction, like making the components of the movement as wide and flat as possible. But everything about the movement is still solid, old fashioned watchmaking, from the materials (steel and brass) to the mechanics of the complications. Although this is a skeleton watch, with an open-worked dial and movement, the density of the movement means it’s not quite transparent. Instead the skeletonisation reveals the detail of the movement, most notably the mechanics of the perpetual calendar in front. On the rear the entirety of the minute repeater mechanism can be seen. 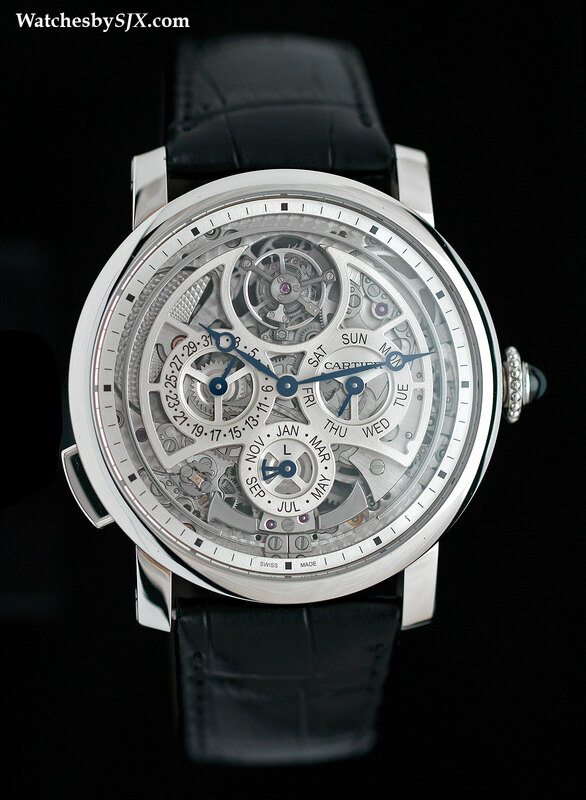 Beyond the complications, the Rotonde de Cartier Grande Complication Skeleton is also automatic, wound via a micro-rotor. It’s a two level rotor, with a slightly larger mass underneath the one visible on the back. 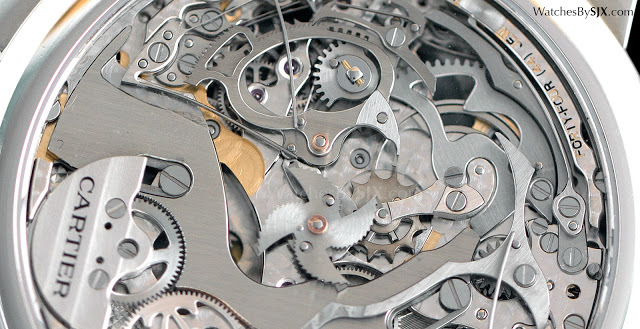 They wind the mainspring via a Magic Lever mechanism, a highly efficient set-up originally invented by Seiko that’s now found in many movements across Richemont, the group that owns Cartier. 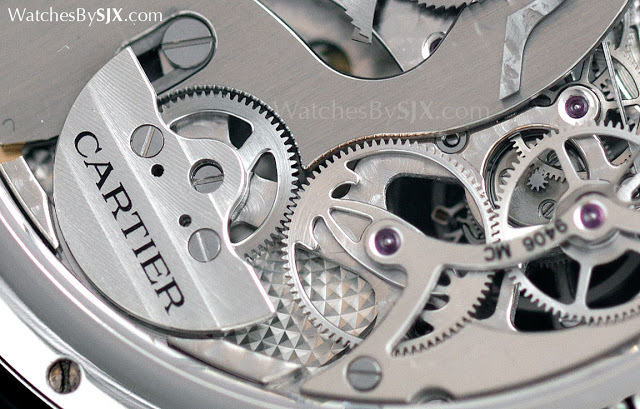 One of the winding wheels for the automatic mechanism has its spokes formed into the double “C” Cartier logo. The grand complication is actually Cartier’s second, in-house minute repeater wristwatch, after the Minute Repeater Tourbillon introduced in 2012. Though the minute repeater mechanisms are obviously different – the grand complication repeater is significantly smaller – they share similarities. The most obvious is the button to activate the repeater at eight o’clock, replacing the slide found in most minute repeaters. A button offers superior water-resistance to a slide (that’s why most repeaters are not water-resistant), as well as reducing the mass of the case, which improves the volume of the repeater. Just beside the button on the front the centrifugal regulator is visible, this device regulates the speed of the repeater strikes. And the hammers and gong attachments are at six o’clock. Despite being relatively small, the hammers still produce a chime of significant volume, thanks in part to the hollowed out case. Despite being 45mm in diameter and made of dense platinum, the case is lightweight, because most of the inside has been removed. This improves the resonance and volume of the repeater. Unlike other recent Cartier complications that were large and thick, the Rotonde de Cartier Grande Complication Skeleton is large but slim, giving it an elegant profile on the wrist. 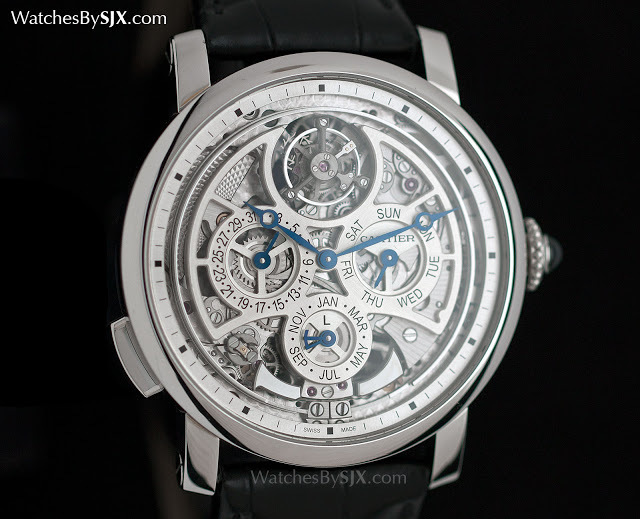 And it has the unusual feature of blued steel Breguet hands, which are very appealing. Though often found in vintage Cartier watches, Breguet hands are rarely used in modern timepieces. Because the pictured watch is a prototype, it lacks much of the decoration that will be found on the production versions, which will have the Poinçon de Genève. Otherwise known as the Geneva Seal, this is a hallmark of quality, covering both decorative finishing and functionality. 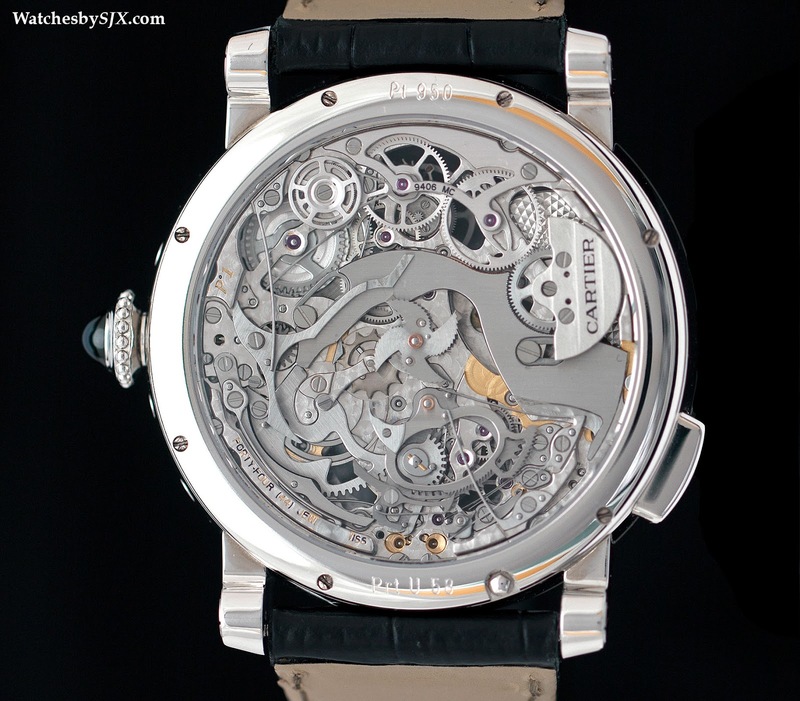 The Rotonde de Cartier Grande Complication Skeleton is limited to just 50 pieces and priced at €600,000 or US$620,000.